In my previous post, I discussed the importance of maintaining an appropriate tone in your admissions essay, and provided tips for checking your tone, specifically for finding a confident tone and avoiding arrogance. Once again, “tone” refers to a writer’s attitude toward their subject (and their reader). Your tone comes across in your choice of vocabulary, whether you choose formal or informal language, and so on. It can be subtle, but it is very important. A strong personal statement or SOP communicates confidence, as we explain, but also professionalism and positivity. How can you ensure your writing conveys the right attitude? First off, what do I mean by “professional” tone in this context? 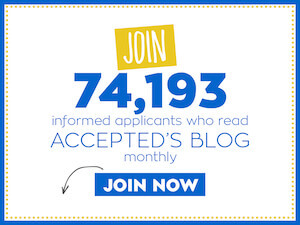 Think about whom you’re writing for: admissions professionals, and possibly professors (depending on your field). In other words: a. educated professionals; and b. members of the field you’re hoping to enter. This means that you should address them as you would someone you respect. No need for stilted formality – but this isn’t an email or text message to a friend, either. Grammar, spelling, capitalization, and punctuation all count. Follow all of the adcom’s directions. This means several things: answering the questions as they are asked; keeping to the requested length; not submitting additional materials they haven’t asked for; etc. Describe your experiences, interests, and goals in a thoughtful way that shows your mature engagement with your field. There is, for example, both a content and a tonal difference between saying you want to study a particular language because it will give you the skills to work in international development in country X, and saying you want to study that language because you just always liked the way it sounds. Let your tone show your positive, collaborative outlook. When you describe work you did with a team, use language that reflects that cooperation (“we”), and take a positive tone (for example, show what you gained/learned from your collaboration and how it prepared you for graduate school). Remember that your professional tone should extend to every interaction you have with the school – whether written or spoken. Each email, phone call, visit, interview – every interaction with every person you meet at your target school must contribute to their overall picture of you as a courteous, professional, positive candidate. Keep every interaction you have with the adcom professional, courteous and positive. Spin the negative into the positive. We’ve written elsewhere about how it’s more compelling to read statements that are phrased positively than negatively. In other words, if one experience didn’t work out, don’t say that you decided to do something new because it was not great or a negative experience; say that you chose to move on to a new opportunity in order to develop your skills or explore an area you were excited about or assume greater responsibility. This is important both for the energy and strength of your writing, and also for your tone: if you phrase statements in a negative way, you risk coming across as negative. It’s much better to be moving towards something attractive than fleeing something ugly. Pay attention to qualifying words. Don’t comment negatively on your undergraduate program (or a company you worked for). If you’re trying to explain a low GPA or other academic challenge, straightforwardly take responsibility for it and do not attribute your struggles to anyone else. Phrase sentences positively (focus on what you DID, not what you didn’t do). Avoid qualifying words that make you sound halfhearted or grudging. Make a tone check part of your editing process, and you’ll be on your way to finding the sweet-spot: professional, positive, and confident. 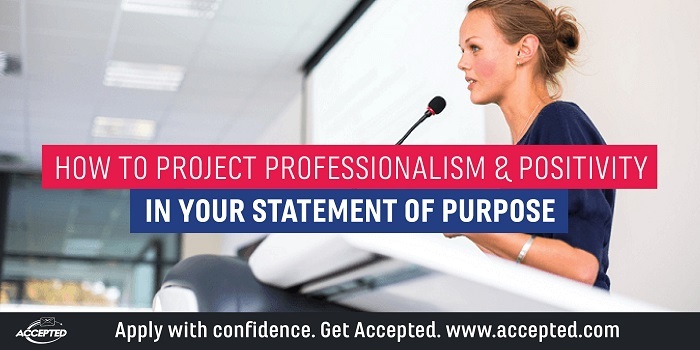 The expert advisors at Accepted can help you ensure that you are projecting a professional, positive voice in your application essays. Learn more about our Admissions Consulting & Editing Services here. Last updated on November 11, 2018.